Massage can be an extremely beneficial therapy to ease physical pain, to manage emotional stress, and to nurture oneself through difficult times. More recently, employers have begun to include therapeutic massage in the benefits package offered to their employees. Employers have come to realize that employees who frequently receive massage have fewer on-the-job injuries, less sick leave time, enjoy their jobs and life more, and create a more positive work environment. Indeed, massage is a basic form of healthcare. 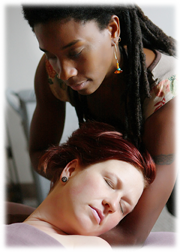 There may be other HMOs & health insurance policies that will pay for massage therapy. It would be good to check your policy or talk with your employer’s human resources officer. We are happy to bill your health insurance company for your massage. Please bring your health insurance card into our office for your first visit, and we will submit all the paperwork for each visit. Generally, co-pays for each massage session are $15-20. Click here for more information about car accident insurance.